Armour, Everest and Tam 111 were popular wheat varieties because of rust resistance, but a new race of the pathogen trumps that move. When a new strain of stripe rust capable of defeating the resistance package of some of the best of Great Plains wheat varieties emerged in Texas in 2010, alarm bells started going off almost immediately in Kansas, weeks before the disease arrived in the state. This year, most farmers didn't know the wheat varieties they thought were resistant to stripe rust would succumb until they saw the tell-tale yellow leaves in the field just a couple of weeks ago. "This is a new strain and it has hammered our best resistance varieties," Sedgwick County Agricultural Extension Agent Gary Cramer told a group of farmers on a Farm Bureau wheat tour with Congressman Mike Pompeo on Thursday. BARLEY YELLOW DWARF: This is the third year in a row that Barley Yellow Dwarf has been a prevalent disease in south central Kansas wheat fields, says Monsanto/West Bred wheat breeder Sid Perry. One reason he thinks the disease is especially bad this year is the warm winter and early spring. Cramer said the three varieties thought to have the best resistance package, Armour, Everest and Tam 111, all proved highly susceptible to the new strain. The result was a wave of calls for fungicide applications. One grower joked that his area "looked like a movie scene from World War II" with airplanes swooping everywhere. Monsanto/West Bred senior breeder Sid Perry led the tour around several research plots in their first year of yield trials in northwest Sedgwick County. Perry said some of the potential new wheat varieties appear promising for rust resistance. However, he said, research has been hampered by the fact that the 2010 strain is not present in Sedgwick County this year. "So we have these varieties that appear resistant to what showed up in 2012, but we don't know how they would do against the 2010 strain," he said. "That's one of the challenges of breeding for resistance. You have to always be ready to start over." 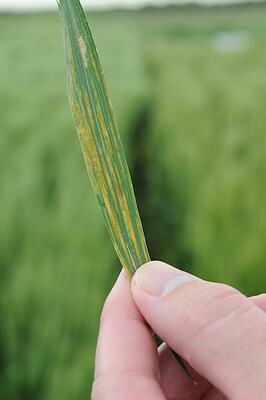 WHEAT RUST: Stripe rust has been a particular problem this year, with a new strain of the fungus hitting varieties that were thought resistant. He said farmers in the region did a very good job of scouting for fungal diseases and he praised them for the timely applications of fungicides. "We will have yield losses to disease," he said. "But nothing like it would have been if people hadn't taken quick action. I think it serves as a reminder that we are going to need to maintain a partnership of research in resistance and a willingness to turn to fungicides when we need them." Perry said Barley Yellow Dwarf is a major problem in many locations for the third year in a row. He blamed the unseasonably warm winter and early spring for a healthy population of the insects that provide a vector for the viral disease.